There has been an explosive increase in real-time Internet-of-Things (IoT) applications, enabling water related industries to exploit insights driven by “smart” data and analytics. In the fall 2017, a “smart” stormwater initiative (that includes conventional LID practices) was initiated in Collingwood. See www.collingwoodpilotproject.com. The project has introduced industry leading “smart systems” (by Rain Grid and SafeSump) for municipal infrastructure applications. Project insights will help water utilities transform through strategic uptake of these products, while supported by a system-based analytical approach. 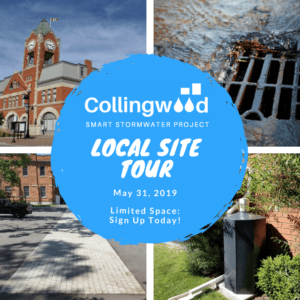 On May 31st, two (small) tours of constructed / monitored sites will be held in Collingwood. The first tour will take place at 10:00 AM and the second tour will take place at 1:30 PM. Each tour will be an hour and a half long and will hosted by Greenland Consulting Engineers, RainGrid and SafeSump. The deadline to register for a tour is May 24, 2019. If you are interested in participating in the tour, contact Jane Buckland at jane@actualmedia.ca to secure your spot.